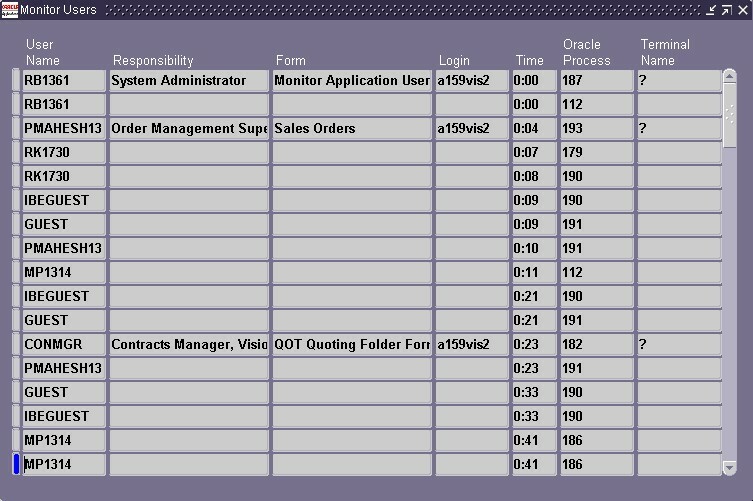 This post provides tips on how to monitor user activity online and via reports available in the system administration responsibility. USER - Will only show you a list of logged in users. 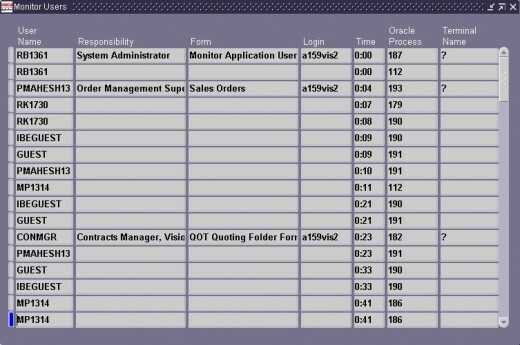 RESPONSIBILITY - Will show you the user logged in and the responsibility they are using. FORM - Will go down to the lowest level of detail and show you the User, Responsibility and Form being accessed. The screen shot below indicates what you would see if you had chosen the FORM option for the profile option in question. Signon Audit Concurrent Requests Report - used to view information about who is requesting what concurrent requests and from which responsibilities and forms. Signon Audit Forms Report - used to view who is navigating to what form and when they do it. Signon Audit Responsibilities Report - used to view who is selecting what responsibility and when they are doing it. Signon Audit Users Report - used to view who signs on and for how long.